No matter how small your space, you can create a decorative garden either inside or outside. Container gardens allow you to harvest unique, colourful combinations of flowers and veggies. These gardens typically need full sunlight and are ideal for lettuce or thin-leafed greens. It’s also important to choose a container that drains well. Terracotta pots may look appealing, but they are heavy and may require assistance to move. Seniors may wish to choose plastic containers, which are lightweight and provide excellent drainage. Once you’ve selected your containers, choose seeds to pair in interesting combinations. Carrots and cucumber are low-maintenance options as well as peppers and onions. Perennials like lilies, poppies and primroses also tend to do well in Vancouver’s climate. Creating a vegetable patch is another great gardening project for seniors. First, select a level area of the yard that is sunny for six to eight hours each day. It’s also helpful to select an area near a garden faucet, which makes watering easier. Canada typically has a short growing season, so select vegetables that are disease-resistant and must be harvested early. These include radishes, leafy greens like lettuce and spinach, beans, and carrots. Growing your own herbs is an excellent way to add spice to your kitchen and fragrance to your garden. Many herbs come in pre-planted pots, which can be added to an existing garden or placed into a container or hanging planter. If using a container, plant as many herbs inside as possible to make watering easier. Many popular herbs grow well during springtime in Vancouver. These include cilantro, basil, and parsley. Herbs require a minimum of 4 hours of sunlight each day and well-drained soil. They also make ideal plants for a kitchen countertop or windowsill. Start winter-hardy vegetables and flowers in March, including collards, kale, radishes, and lilies. In April, you can expand your garden to include lettuce, swiss chard, and most herbs. When weather is still cold, start seeds indoors to prepare them for spring planting. Be mindful of frost – when cold conditions persist, it may be better to hold off until warmer weather arrives. 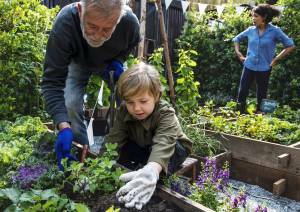 Gardening can be a fascinating and health-boosting hobby for many seniors. With these tips, you or your family member can build a beautiful garden that will be enjoyed for years to come. An On-call Nurse is available 24 hours a day, 7 days a week to assist clients or caregivers if you are in need of assistance outside of our regular office hours.